The historic elegance, unique culture, and spectacular hotels are just some of the reasons why millions of travellers visit Istanbul each year. With a city of nearly 14 million people, you begin to wonder what hidden gems lie beneath its surface. The markets and bazaars are good places to begin your search. Typically open from 9:00 – 19:00, Monday – Saturday, treasure hunters from around the world (as well as the locals) flock to these bazaars in search of their particular item in mind. From the mundane to the insane, the markets in Istanbul are important to visit during your time here. While there are more shops and stalls located throughout Istanbul then one can ever hope to know, here is a short list featuring the top 4 markets and bazaars in Istanbul. Also known as the Egyptian Bazaar, this open air market takes the number one spot from the typically crowned Grand Bazaar mainly due to the smaller crowds, picturesque shops, and its overwhelming choices of Turkish delights. The endless array of spices and freshly ground coffee fill the air with a sensational aroma and helps create a backdrop for the light to dance about its floating pieces. Dried fruits, nuts, oils, and herbs are just some of this enormous bazaar’s specialties. 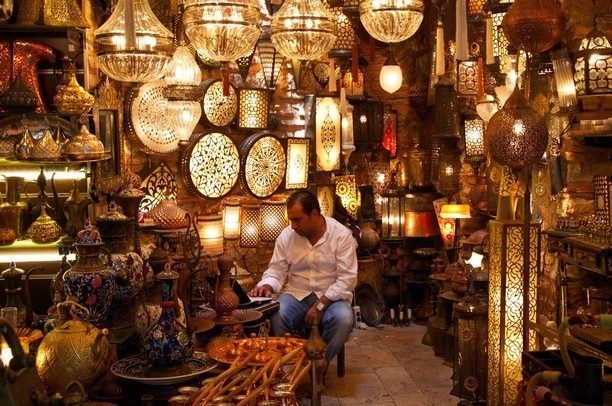 Take a step back in time and experience a bazaar that has been around since the 13th Century. Now one of the largest covered markets in the world, it’s possible to get lost in a labyrinth of over 5,000 shops and stalls. Leather goods, spices, ceramics, carpets, jewellery, and much more are waiting for your discovery in the heart of the bazaar. Although it may get little claustrophobic at times, especially during the weekends where the markets can draw in near to 400,000, there are plenty of cafés and restaurants where you can relax and people-watch until the crowd dies down. This popular market sits right next to the Spice Market and holds more than just daisies and dandelions – it’s a reserve for unique worldly flowers. Yes, the Flower Market receives a lot of attention due to its puppies and seemingly endless supply of rabbits, turtles, fish, aquaria, and even a small area for pet food – in addition to its flowers. If you’re hungry, you can find fruits and veggie seeds as well as multi-colored chili plants. If you’re traveling to Istanbul and need a good book to read, check out this bazaar in the historic center of Istanbul, Beyazit. Here, they sell anything from university books, religious books, rare old books, as well as new arrivals. Nestled in an ancient courtyard, these small bookstores even hold precious gems for travellers: books in other languages other than Turkish. Some of the bookshops here are even open on Sundays. Follow for more travel tips below! It’s something special, right! Glad you liked our post!